C.H. 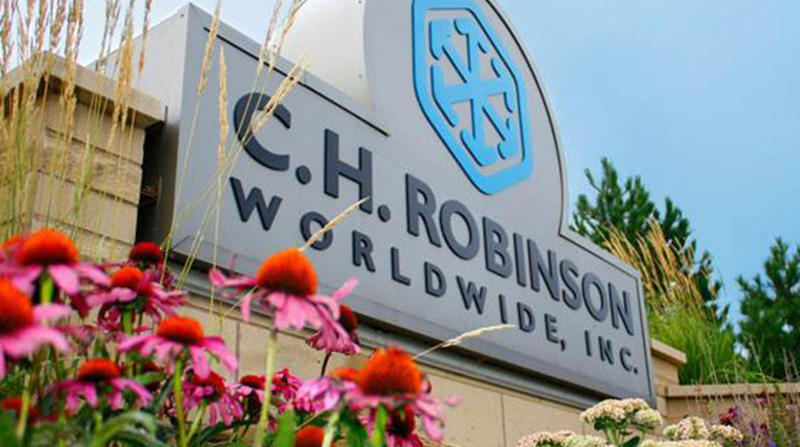 Robinson Worldwide reported profits jumped 25% in the fourth quarter, outpacing results from one year ago even after also eliminating the effects of the Tax Cuts and Jobs Act on the bottom line. The third-party logistics company recorded $152.6 million in profits or $1.08 per share in the final three months of the year. The tax law, which slashes corporate tax rates from 35% to 21%, added $12.1 million to the final results. One year ago, the Eden Prairie, Minn., company generated $122.3 million in profits or 86 cents. Top-line revenue rose 16% to $3.96 billion, easily surpassing the Bloomberg News forecast of $3.72 billion. After deducting transportation costs, net revenue increased 13% to $604.7 million. Even the strong finish to the calendar year, C.H. Robinson’s 2017 results lagged behind 2016 results. Profits fell 1.7% to $504.9 million or $3.57, even though revenue for the year rose 13% to $14.9 billion. Net revenue grew 4% to $2.4 billion in 2017, but operating expenses jumped 11%, causing income from operations to decline 7% to $775.1 million. Last year, truckload brokerage revenue slipped 2.2% to $1.2 billion and intermodal dropped 13% to $29.1 million. Less-than-truckload revenue rose 6.6% to $407 million, ocean jumped 19% to $290.6 million and airfreight grew 23% to $100.8 million. C.H. Robinson’s North American Surface Transportation also finished with a strong fourth quarter but it ended the year behind 2016 results. The division primarily handles truckload, less than truckload and intermodal business in the United States, Canada and Mexico. Top-line revenue in the division increased 15% to $2.6 billion and net revenue rose 13% to $415.3 million. After expenses, operating income improved 15% to $180.6 million. Truckload net revenue increased nearly 17% to $304.5 million even though volumes declined 3%. Less-than-truckload revenue improved 11% to $100.5 million in the fourth quarter and volumes rose nearly 10%. Intermodal net revenue plunged 34% to $4.7 million. In C.H. Robinson Global Forwarding, top-line revenue surged 24% to $591.2 million, net revenue rose 12% to $127.9 million, but operating income declined 32% to $16.8 million. The division struggled because of a 24% increase in operating expenses. “This increase was due to increases in both personnel and selling, general and administrative expenses. The personnel expense increase was driven by an average headcount increase of 19%. The acquisition of Milgram added approximately 7.5% to Global Forwarding average headcount. The selling, general and administrative expense increase was primarily driven by the addition of Milgram,” the company said in the earnings release. Robinson Fresh, which handles logistics to transport fresh fruits, vegetables and other perishable items, reported a 12% improvement on top-line revenue to $594.6 million and net revenue rose 4.6% to $54.1 million. However, income from operations declined 0.7% to $12.9 million because expenses jumped 6.4% due to higher pay and variable compensation. C.H. Robinson ranks No. 5 on the Transport Topics Top 50 list of the largest logistics companies in North America.